The adult coloring page phenomenon sure has taken off! Of course, anyone can color these images – not just adults. I think using the term adult coloring book or page gives us permission to have some fun and color! Whenever I go to my local art store the shelves are full of coloring books targeted at grownups. I though it would be fun to transform some of my designs into coloring pages! 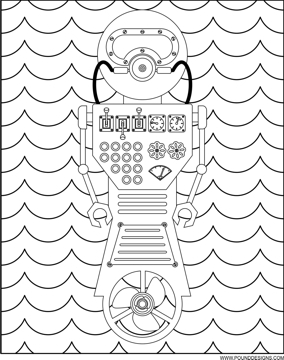 Download and print a copy of the Underwater Robot Coloring Page, grab your pencils or markers and go for it!